HEAVENandHELL is a heavy rock band that takes cues from such acts as Santana to include great musical sections and solos. 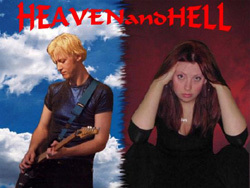 HEAVENandHELL is a new group that is currently forming. Gregg has played in other people's bands for years, but has decided to put together his own band. This is Mia's first original band.